Tanzanite is a relatively modern gem. The discover was in 1967 by the Maasai herders who found the blue crystals in the Merelani Hills near Arusha Tanzania. They showed it to a prospector named Manuel d’Souza, who promptly registered claims with the government of Tanzania to begin mining. He thought it was sapphire at first, but the crystal was identified as a blue variety of zoisite. Tiffany & Co. agreed to become many distributor in 1968 and promoted the gem as a substitute for sapphire and called it tanzanite. Tanzanite is still only found on a few square miles of land in Tanzania near Mount Kilimanjaro. The blue color ranges from pale blue to intense ultramarine with violet undertones and is caused by trace amounts of vanadium. 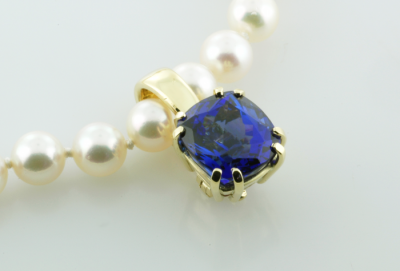 Tanzanite is heated to minimize the brown color that it natural occurs. Tanzanite’s hardness is 6.5 – 7 and is better suited for earrings or pendants.